Essential oils can support many areas of the body. You won’t want to miss our list of the best roller bottle blends for the entire family. Essential Oils are powerful – they can be used aromatically (in a diffuser); they can also be used topically – diluted with a carrier or, added to a roller bottle. 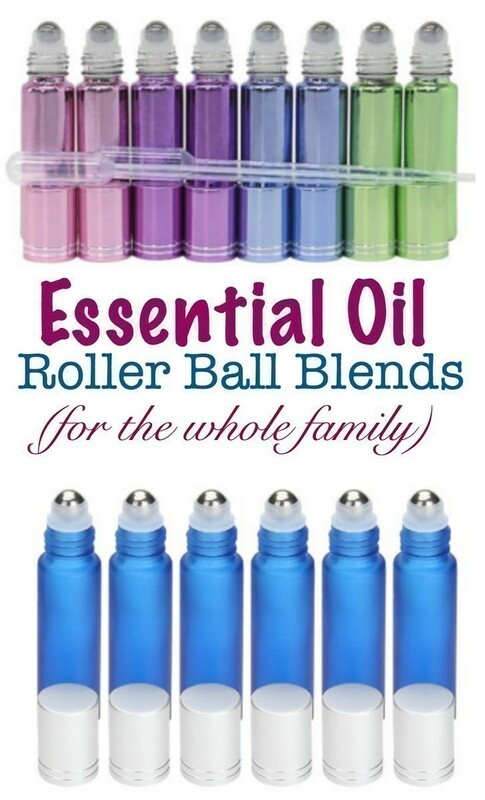 One of the best ways to use essential oils are in various roller bottle blends. The best part about using roller bottle blends is that they are pre-made – when you need to use them, you don’t have to mix up oils with a carrier in your hand. You can use them on the go. Pop them in your purse, or give them to your kids to take to school. They are so fabulous to have – carry to work, in your purse, maybe your kids take them to school — to reap the benefits of some of the oils without having to be at home or, carrying tons of bottles with you. When you use roller bottle blends, you are using pre-made mixtures, added to a 5 or 10ml roller bottle. You are stretching the oil out by adding a carrier oil – and by using that carrier oil, you are not diluting the effectiveness of the oil, instead you are giving the oil greater coverage to help the oil carry itself with greater coverage. The bottom of the feet, wrist and behind the ears are 3 of the best places to apply essential oils to your body. The bottoms of the feet are the least sensitive part of the body – making them the perfect place to try out essential oils. When you are applying essential oils to the bottom of the feet through a roller bottle blend, they are absorbed quickly because the feet have larger pores. Since the feet are the least sensitive, they are the best place for those hot oils like Oregano, Peppermint, Thieves and Clove. Essential oils applied to the bottoms of the feet are absorbed more quickly and therefore reach the bloodstream faster. Not to mention that the feet and hands are the only two places on the body without sebaceous glands – because of that, items applied to those areas are absorbed more quickly. No matter where you choose to apply your oils, ensure that you avoid the eye area and avoid touching your face near your eyes when you are done using them or applying them. Each of these roller bottle blends use a 10ml roller bottle; add the designated drops to a 10 ml bottle with your choice of carrier oil (noted above). Do you work out? Or maybe you were doing too much at home ~ here’s a blend for you! Can’t sleep? This will help! Have someone who can’t stop snoring? A drop of Valor under the big toe helps, but you might want to try this too. Great to send off the kids to school, and even better for homework time. This is great if your kids experience bug bites or itchy skin from being outside. Apply every hour around the ear (NOT in!) and down the side of the neck, until 1-2 days past pain. Apply to the affected area as needed. One advantage of roller bottle blends is that they are pre-made. When you need to use them you don’t have to mix up oils with a carrier in your hand. You can use them on the go. Just pop them in your purse, or give them to your kids to take to school. If you like these roller bottle blends, you may also enjoy these Back to School Roller Blend Combinations.